Download links will be available in 3 places after checkout. 1. On the successful order thank you page after checkout. 2. You will receive an email with the download links. 3. In your account under the downloads section, if you create an account during checkout. Up to 15 Pictures Included Additional Pictures @ $2 Each. Sending pictures and information for the program is done via email or on our contact us page. We customize your program incorporate as much or as little content as you need. 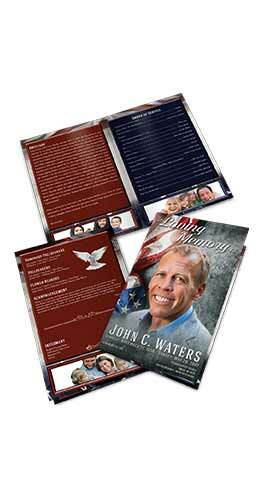 Your program will be fully personalized with your own words, titles, poems, verses, obituary, service details, and pictures making it a lasting keepsake for everyone. With full service customization, you can send us the infomation and pictures in email or in our contact us page. We can communication via phone, email and chat until your program is perfect and ready for print. Is Your Shipping Address The Same as Billing? How Many Images Can I Include? This funeral program template is easy to edit yourself, or use our professional services to do it all for you. All Text is completely editable. Since ALL text can be edited by you, this program can suit any occasion. This template can be used on as many computers and as many times as you like. We offer you with all the help you need to make sure you have a beautiful funeral program. We try to make things as simple for you as possible. If you choose to put everything together yourself, the instant download is ready immediately after purchase. The Microsoft word template looks exactly as you see in the images and all text is editable. If you choose our preferred option of allowing us to professionally customize everything for you. After purchase you are still able to download the template immediately. There are several ways for you to get us the information and pictures you need included in the email. One way is to use our contact form on the Contact Us page. This will allow you to upload all files directly to us. The other option is email. You will receive an email from us immediately after purchase. You may reply to this email and attach all the files necessary as well. Dont worry, we will always be in touch after your purchase and we will keep you updated every step of the way. Please consult our FAQ page for more information. We currently do not have a set number of proofs before we finalize or print your programs. We will be working with you while putting everything together, and when changes are needed or suggested we will make them for you. Needless to say, the final program you will receive will be breathtaking and everyone will keep the program as an everlasting keepsake. Just like the amount of proofs, we do not currently have a set limit of images, although we do have a set limit of free images included with our Professional Full Service option. DIY Template files ares setup for different amounts of images, but you do not need to follow this, you can include as many frames with images as you like. We will print everything you for, professional quality all done in Digital Printing presses. Why pay premium prices for printing at a local Staples or Kinkos when the quality does not compare to what we offer you when it really matters most. You’re loved one deserves the best. And our prices are very competitive with superb quality. This is our specialty and we deliver only the best. We Get Everything To You On Time! To give you some piece of mind, here is a short description of how we work in terms of turn around time and delivery times. DIY templates are available immediately after purchase. Even if you chose to have us professionally put everything together for you in a spectacular way, you will still have access to download the word templates immediately. If you have everything ready to send us (pictures, obituary, order of service and the rest), we can finish your program in the same day and we will send you print ready files for local printing if you choose to print yourself. If you need your programs delivered ASAP, we offer same day printing. Keep in mind we need to have all print ready files complete to our printing department before morning to avail same day printing. When we do the professional work for you, you dont need to worry. If its in a rush, we can use UPS Next Day Early AM Delivery. This option is more expensive than regular turn around times, but we know sometimes you need it right away, and we are always available to get everything to you on time. We’ve never been late on delivery to a service!!! To offer you the highest quality remembrance keepsakes when they matter most. We don't want to give you anything but the very best, and at a great price. Professional digital printing presses with either Premium Matte or Premium Gloss paper with various printing options. Contact us for specialty papers. We always exceed your expectations. We know your loved was important to you and deserves a remembrance keepsake that truly commemorates their life for all friends and family, and this is the only time to do it right. And we are here for you to do it right like no one else can. We strive to bring you the best funeral programs, keepsakes and customer service you need during this difficult time. If you need a quality funeral program, look no further, we are here to give you exactly what you need.